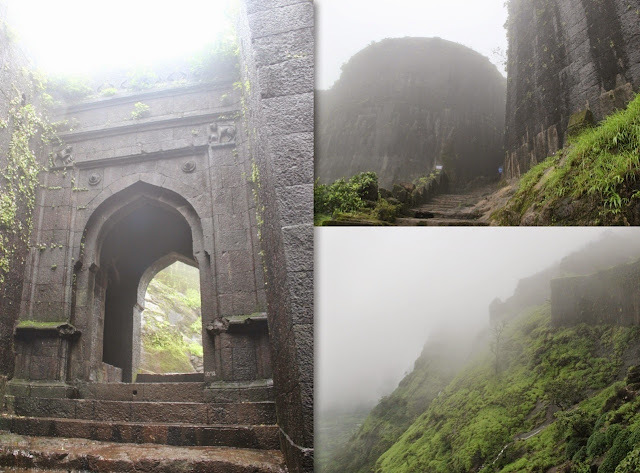 "Shivthar Ghal, also known as Sundarmath, is a cave, about 34 km from Mahad, near Barasgaon. Samarth Ramdas dictated Dasbodh to Kalyanswami. 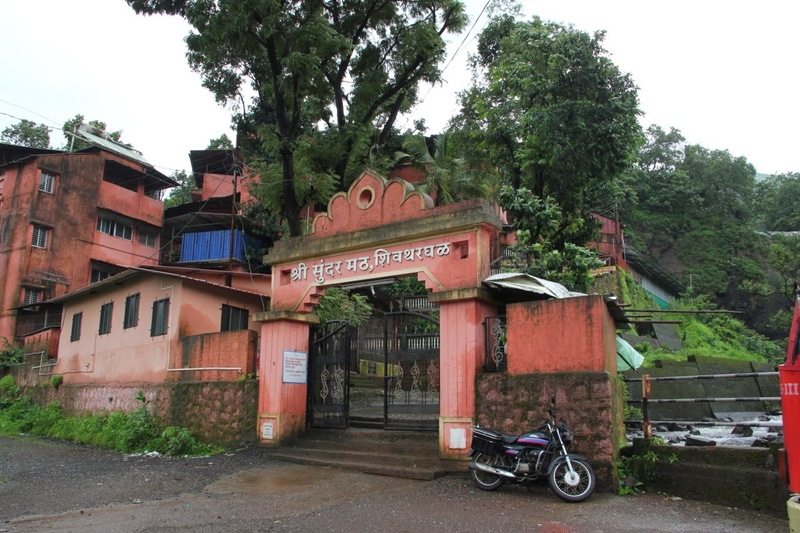 Samarth Ramdas lived here for about 22 years. 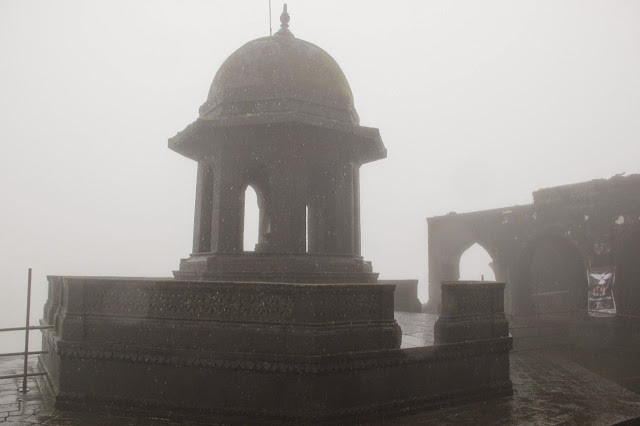 It is believed that this is where the first meeting between Shivaji Maharaj and Samarth Ramdas took place. 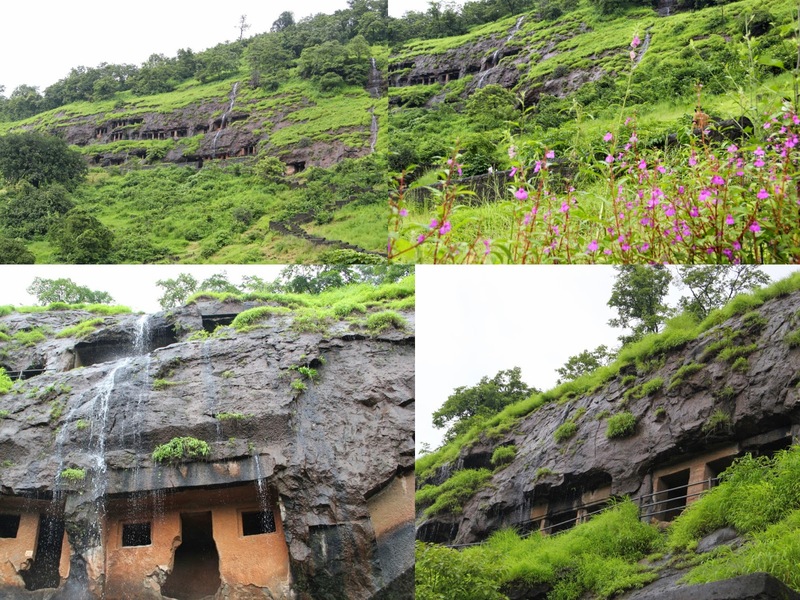 The cave was discovered by Shri Shankarrao Deo of Dhule in 1930. The cave and surrounding area was renovated after Samarth Seva Mandal was formed in 1950. 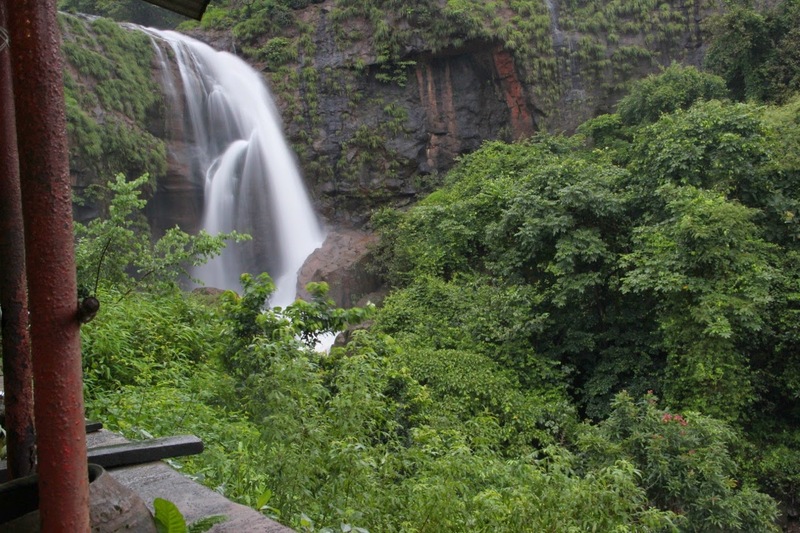 The campus includes the actual cave under the waterfall, Ramdas Swami temple, dining hall and accommodation. 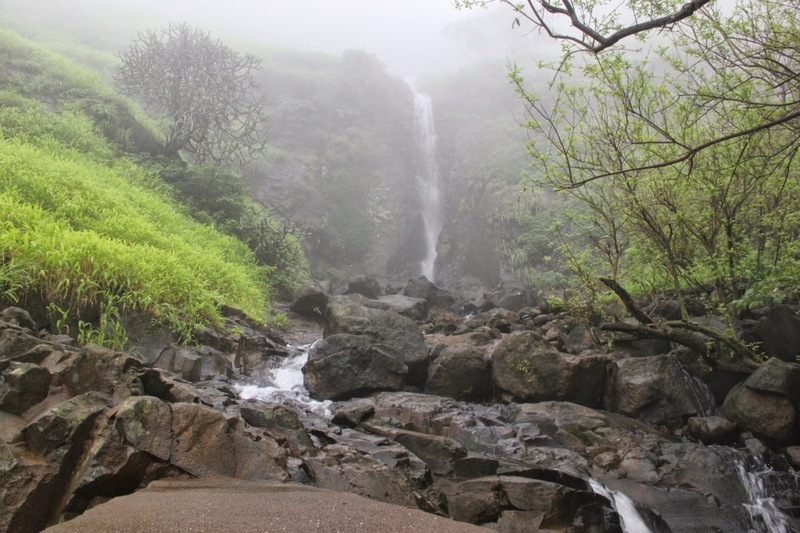 Shivthar Ghal is located in Varandha Ghat in the Sahyadris on the Bhor-Mahad road." On our way to the math, I saw this beautiful house and told that it would be great to live there. 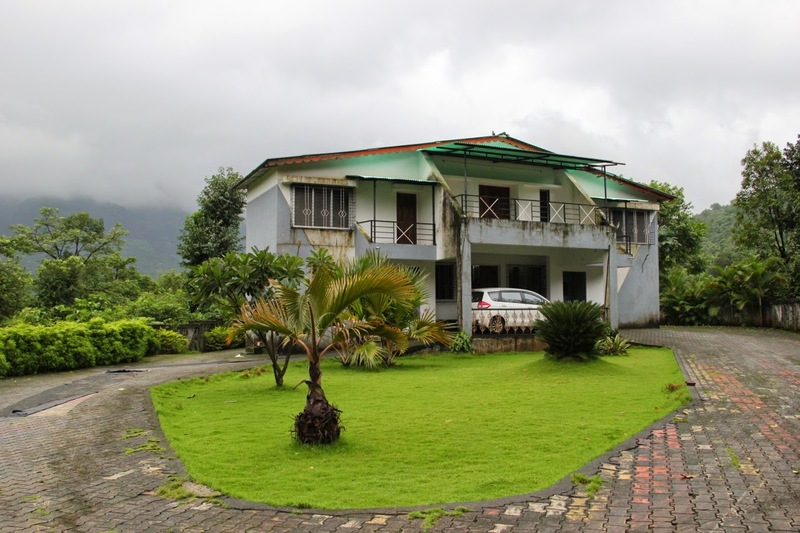 While enquiring at the math we learnt that they had only basic amenities and we had to carry our blankets and instead could choose to stay at the Raigad Jilla Parishad Guest house. And that happened to be the beautiful house we had passed by. That happy coincidence was more than welcoming and we immediately drove to the place. Standing alone without people attending to it, it appeared like an haunted house. The caretaker and his family live in a small outhouse behind the guest house. Well, the whole bungalow was ours but we booked two rooms for Rs 500 each. Food was extra and he charged Rs80 for a meal. There is also a VIP room that is only reserved for Government officials. We settled in and then quickly got ready to go to the math for Aarathi that happens from 6:00 to 7:00 PM. Three old men and one old lady sat in the main hall singing prayers. As soon as we entered, the lady gave us books which had all the Bhajans. We sat there for about forty five minutes singing the Bhajan and Jap along with them. It was a nice experience. 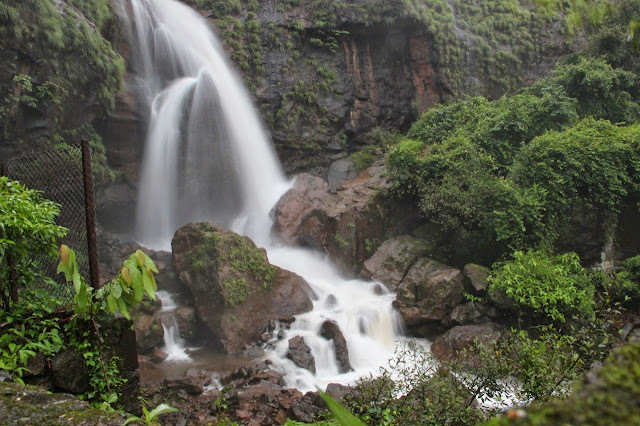 The ashram is inside a cave and a beautiful but furious waterfall falls very close to the place. The sound of the waterfall was so loud that standing in front of it made me feel scared of the power it holds. The cave actually is below the waterfall and as you walk towards it you get drenched by a light shower. We returned back to the guest house and waited for food. The math also offers food but we choose to have dinner at the guest house. After a long wait our dinner arrived at around 10 PM. Rice Bhakri, Baingan and Potato Sabji, Dhal and Green chilly Tesa with some rice. Everything tasted very delicious. After a good nights sleep, I woke up at around 5:00 AM next morning (September 1st). 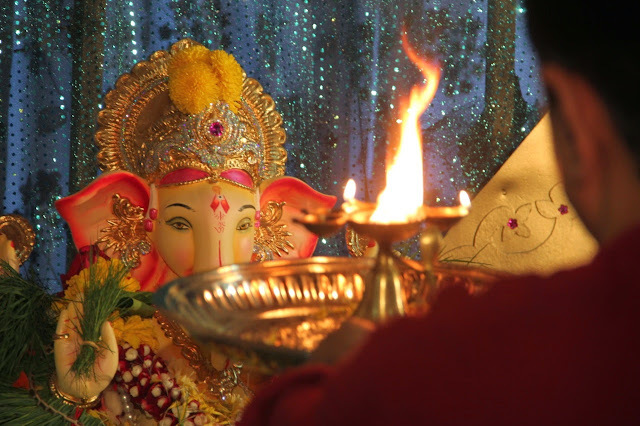 Ganesh Bhai was getting ready to go for morning Aarathi. I decided to join him. We freshened up and left. The same gathering of devotees were there. We sat with them and sang bhajans and prayers. I felt very relaxed and peaceful there. 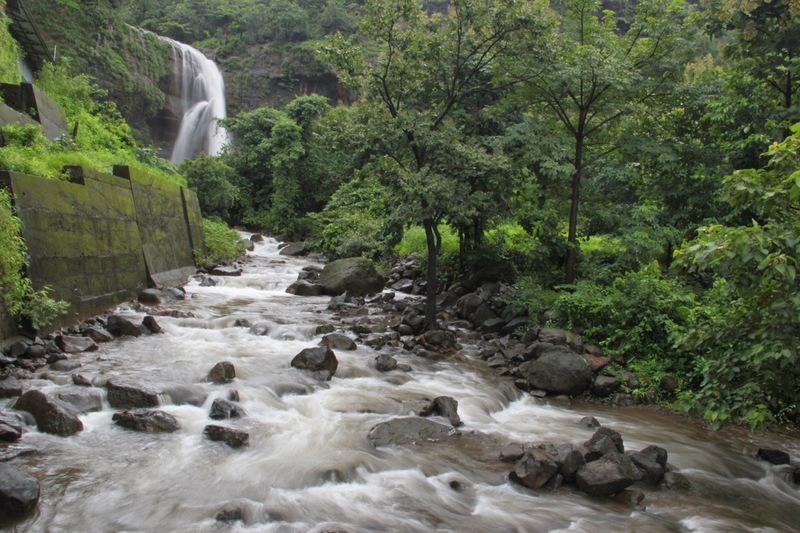 The music of bhajan seemed to blend with the sound of waterfall. We were offered some tea at the ashram. We took a small walk up the hill behind the muth. The path leads to a village. After climbing a few distance we decided not to continue and return as we were unsure of how far up the village was. At the guest house delicious Poha and tea was waiting for us. I had requested the caretaker the previous night to add some potato to the poha. His wife had added some finely chopped potato to the Kandha poha that tasted brilliant. We got ready and left by around 9:00 AM. On our way we stopped for a while to absorb the beauty of the place. 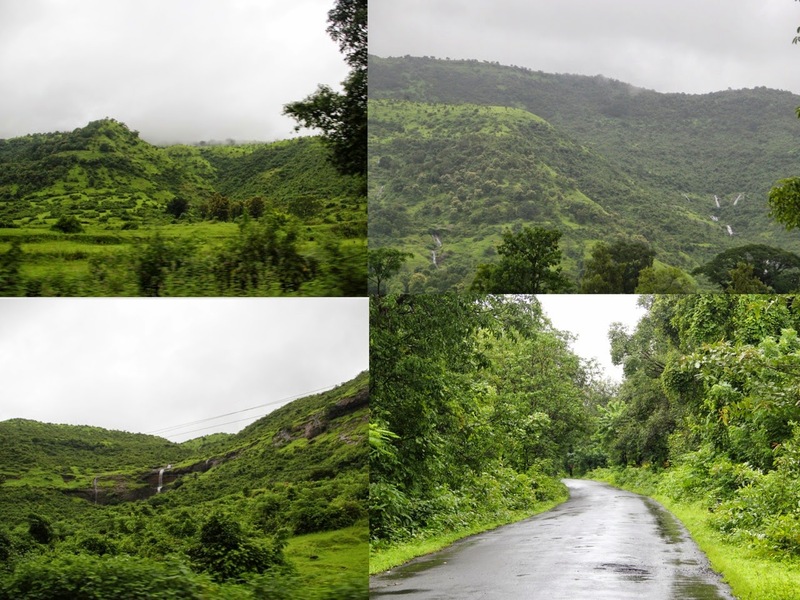 This is one of the best places I have visited in India; very meagrely populated, an abode of greenery that radiates only positive energy. On our way back we stopped at Pale caves near Mahad. 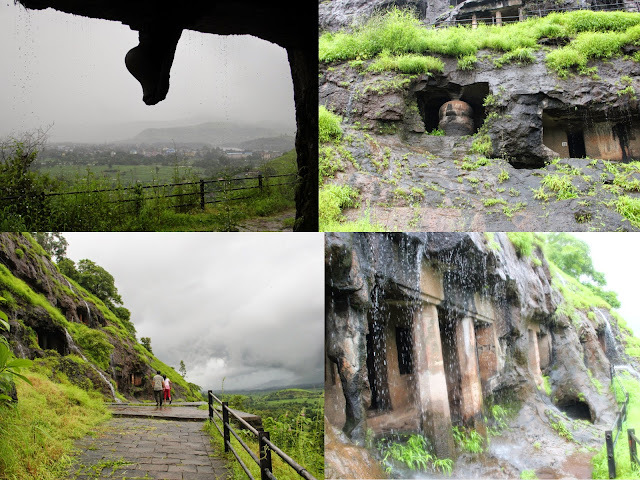 The design in these Buddhist caves are not very intricate but still possess a charm of the bygone days. 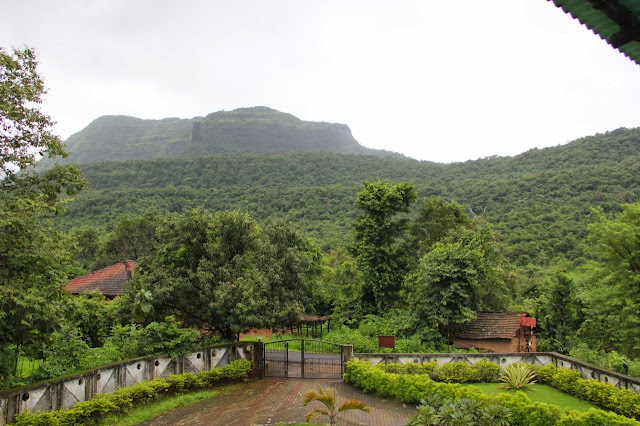 Again the beautiful view of Sahyadri mountains followed us where ever we went. Countless waterfalls pouring from its shoulders. 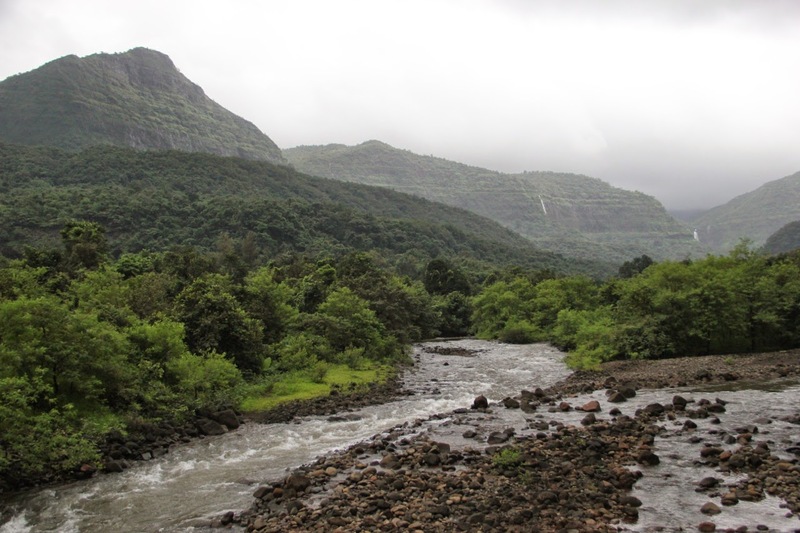 We hurried back to Panvel as I had to leave to airport by 2:00 PM. But not before stopping for a quick vada pav. How can I leave Mumbai without eating its most famous dish? Even though i ordered one, i could not resist a second one. There is something unique about the vada pav that you get in Mumbai than those that are found else where and should never be missed. 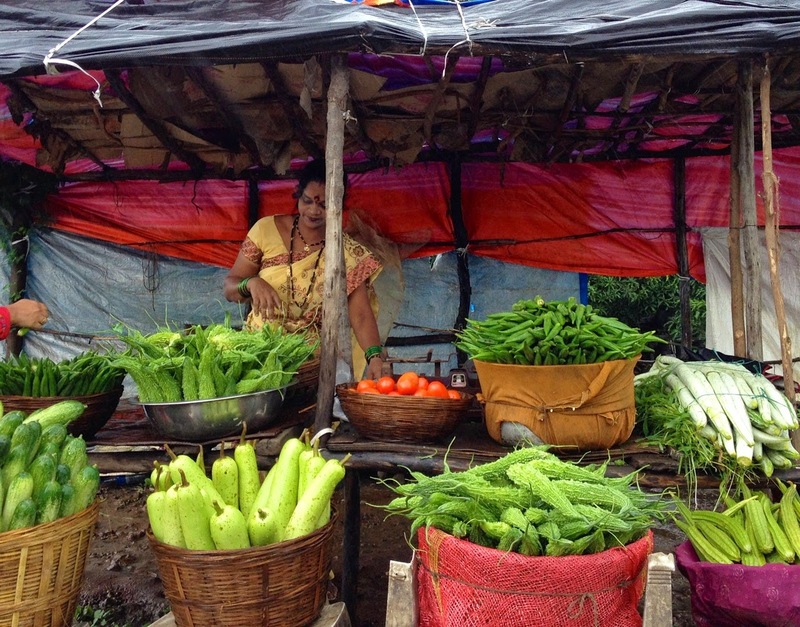 And also not before stopping to buy some vegetables from this vegetable vendor who was all decked up with a traditional attire. 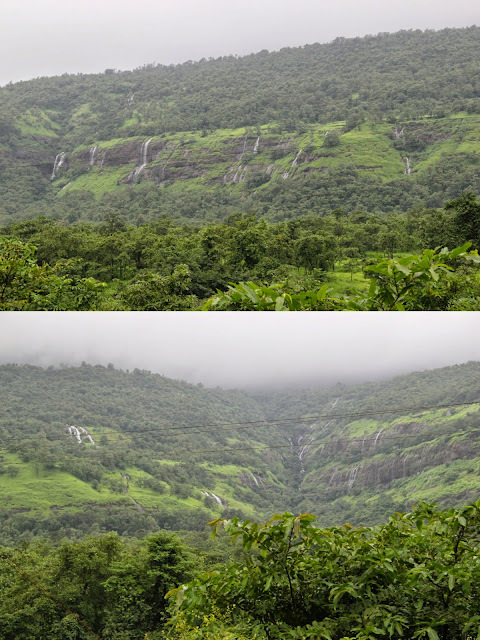 We reached Panvel at around 1:45 PM. Akki had ordered Johar bhakri and some Sabji. She quickly prepared some Kichdi and we had a quick lunch. I left for airport by 2:30 PM. My flight was delayed by 45 minutes that gave me enough time there with which I did nothing. I was still in a blissful mood that the greenery of Sahyadri had filled me with. At the other end of my flight a mundane life awaited me but I wished to keep drifting like this instead. Fortunately or unfortunately all good experiences have to come to an end so that we can cherish them and value everything involved with it; the magnificent view that you filled your eyes with, the people who accompanied you and helped you get around, The people you met on your journey and the moments shared, the food you ate and then those magical moments that make you wonder why are you there of all the places that you could have been in? The flight was uneventful. I tried to catch some sleep and when I woke up, the plane was close to landing. As I took a taxi back home, I realised how untouched by the festive mood this city was. 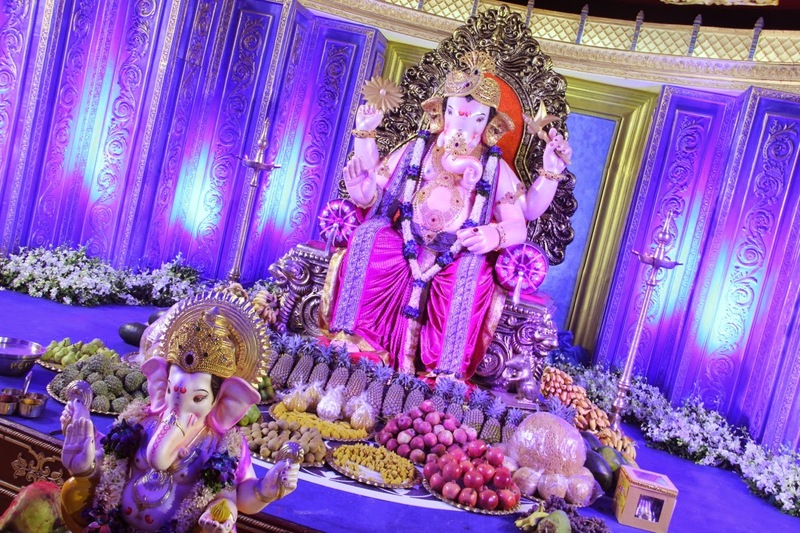 In Bangalore and even Mangalore, Ganesha festival is more about cultural programs but I had returned from a place where there was only devotion where ever one saw. Importance was given to the intent and not some dance or music program by a celebrity. From a lively and green vacation I began to drive on the roads leading to regular life. I knew that it would take me at least more than a week to get over this Mumbai Hangover. On the Morning of Aug 31st, at around 6:30 AM we left Panvel in a Maruti Ertigo; Bawa, Akki, Deeku, Ganesh Bhai, his son Shivam, his friend Vineeth and me. It was drizzling all through the route. 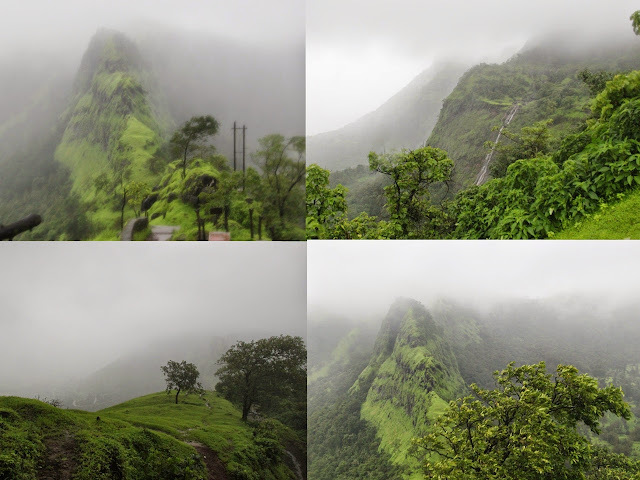 We took the Mumbai-Goa route towards Raigad. On our way we stopped at a Kamat Hotel to have some tasty Misal Pav for breakfast. Sayadri mountains are at its best during this season; with lush surroundings filled with countless waterfalls. We reached Raigad at around 10 AM. I had carried my Poncho and that came really handy. We rented some extra Umbrellas for Rs50. A cable car ticket price is Rs180 per person. While the rest took both way ticket I insisted on trekking back alone. So I took a one way ticket. 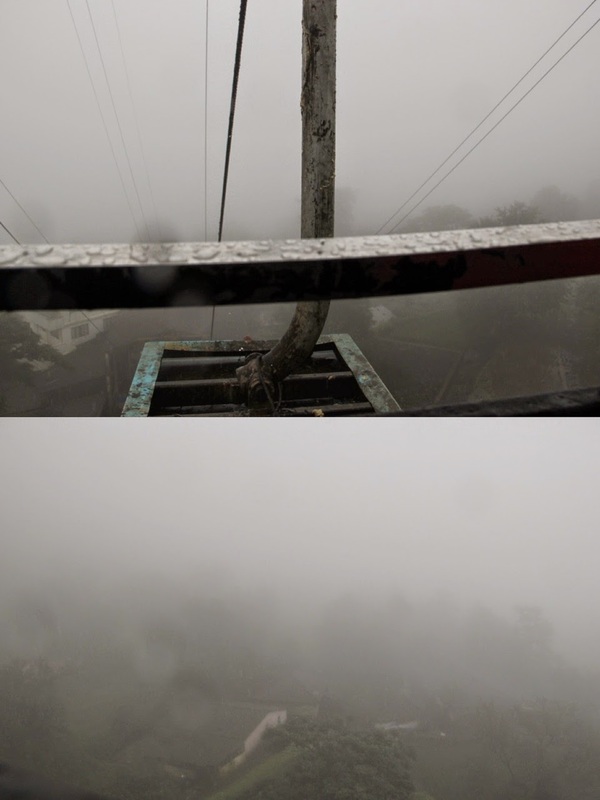 The ropeway ride was interesting. However the mist prevented a good view of the surroundings. 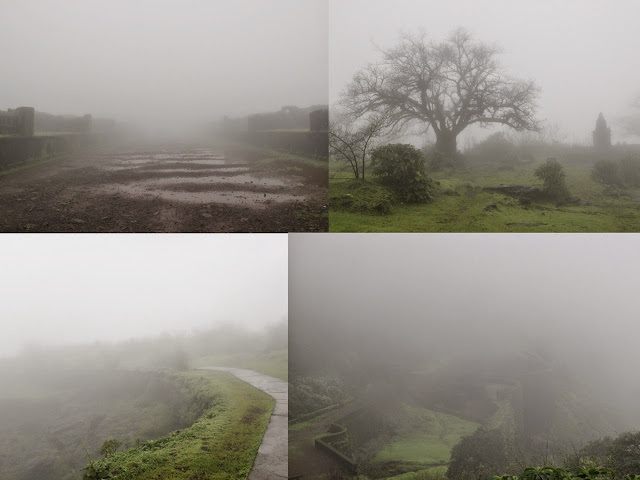 It was like taking a 5 minute climb into the clouds. At the summit, we hired a Guide. We also ordered some Bhakri for lunch from a lady who told she would keep the food ready and meet us at the temple. 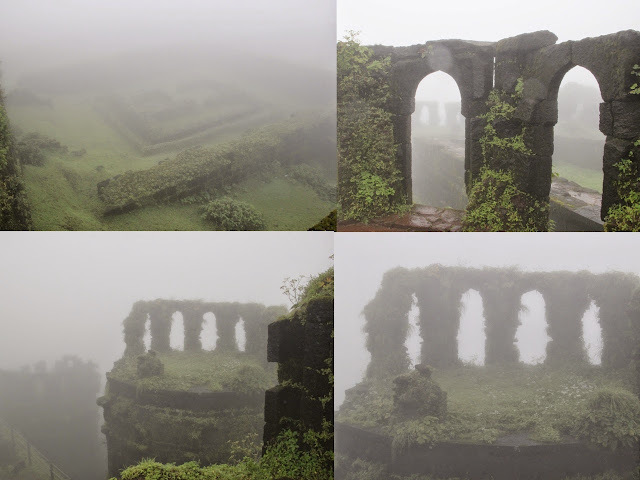 Our guide impressed us a lot with his manner of narrating the story of Shivaji and his eight wives. Like a thriller, he disclosed the reason behind only six queen rooms in the palace. One wife stayed with Shivaji’s mother and the other had some health issue due to which she stayed downhill. Of course the palace of Shivaji is all in ruins as the British bombarded the fortess in 1818 using cannons. We visited the main durbar where the coronation of Shivaji happened. A replica of the throne sits there today. Our guide gave a good loud announcement praising the Maratha King Shivaji and we all followed him with a Jai at the end. We walked past the main doors and the market places that in this cloudy weather looked magical and appeared as if we were taking a tour to the mystical world of the Maratha empire. Before leaving us, the guide gave a live performance from one of the plays. He enacted the dialogue of Arungazeb where in he praises his own enemy Shivaji. Our talented guide had amazing voice and he just impressed us all with his dramatic end to the tour. We took a walk to the Jagdishwar temple. 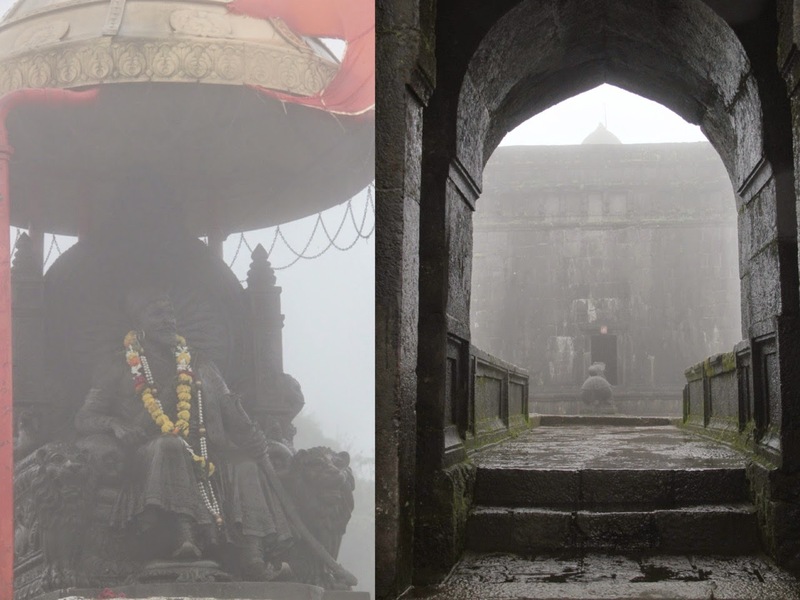 Next to which is the tomb of King Shivaji. A small sculptor of his dog Wagya who is believed to have jumped into the fire is also placed in front of his tomb. But certain controversy surrounds this as whether this is actually based on a recorded event or was installed as an insult to the king. At the temple, we met the lady who had promised us food. She lived in a house behind the temple. 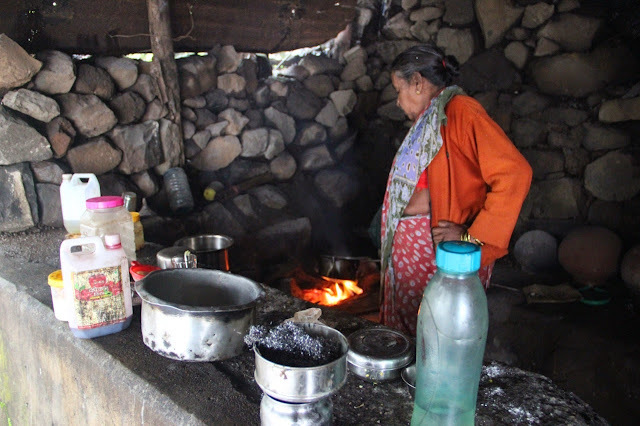 We followed her through narrow streets to a small hut where her family has been living since more than 60 years. The archeology department has denied electricity here hence they live there with minimal privileges. But for we hungry people, she was a saviour by preparing for us some delicious rice bhakri, junka and spicy tesa. I just loved the food. This was an experience I shall never forget. I thanked her for the delicious food. While the others took ropeway back, I took the steps down all alone. On my way I passed by several waterfalls. Occasionally the sky cleared and displayed some fantastic view of the area. I met a group of Engineering students who requested me to click their pictures and email it to them. I stopped at a small tea stall where an old lady made some fresh tea for me on Chulha. The view from the tea stall was amazing. The trekking trail was also very impressive. Thankfully there are no leeches here like in the western ghats. I reached the base in around one and half hours. My poncho came of great help because the rain did not stop at all. This trek though short was very exciting because at times I found myself alone in the forest. There was nothing but the sound of rainfall as it hit the green leaves and that of the waterfall at a distance. It was simply magical. At the base, I met with others and we left to Shivathar ghal. As I have already claimed before that only other city of India that I would like to live in apart from Bangalore, would be Mumbai. I just love the city and every time that I visit my sister, I make sure to live the city rather than just visiting as a tourist. Over the years, this liking has made me travel every 6 months. This time I picked August for two important reasons - The Monsoon and Ganesha Festival. 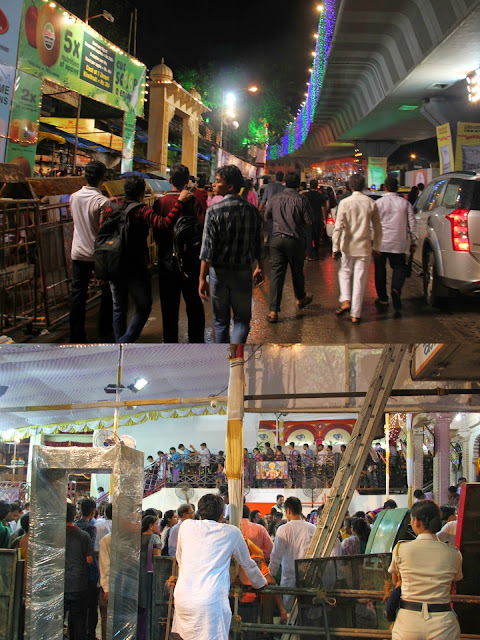 I had originally intended to go during the visarjan to capture the crowd and the immersion of Lord Ganesha. But for several reasons that seemed less possible. So I decided to go during the festival. I had only 3 days of rest before I packed my bags again. 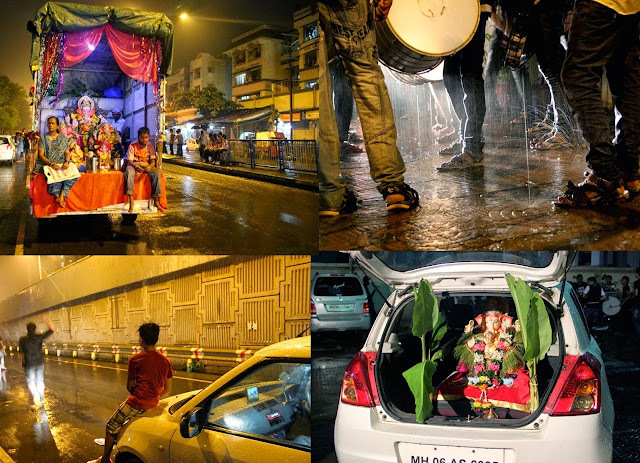 On the day of Ganesh Chaturthi (29th Aug), at around 4:45 AM, I left to the airport. I had expected a long wait at the counter but everything happened fast and I was at the gate within half an hour. Almost immediately, I was to board the aeroplane. The flight was uneventful and as soon as I grabbed my bags from the baggage claim, I headed to the prepaid taxi counter and booked one to Panvel. 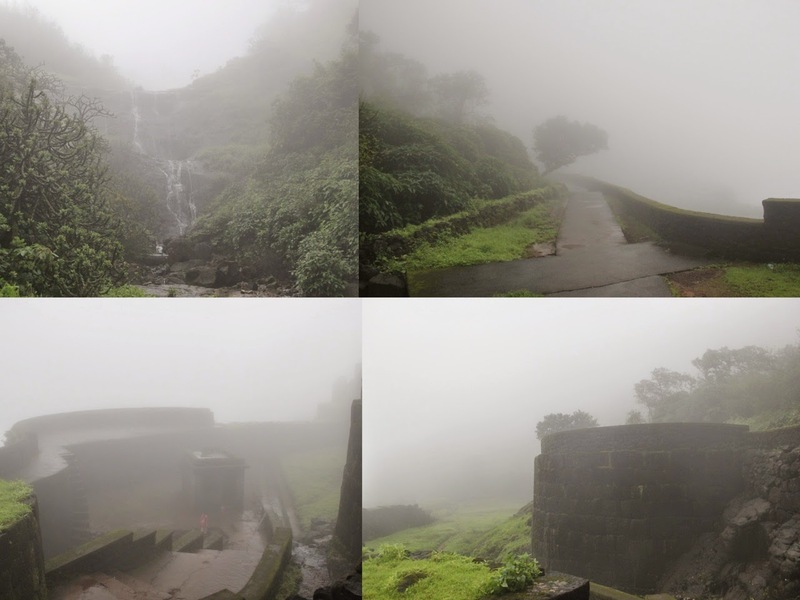 It was around 8:45 AM by the time I started my drive towards Navi Mumbai (New Mumbai). As soon as I drove out of the airport, a stench filled the air. 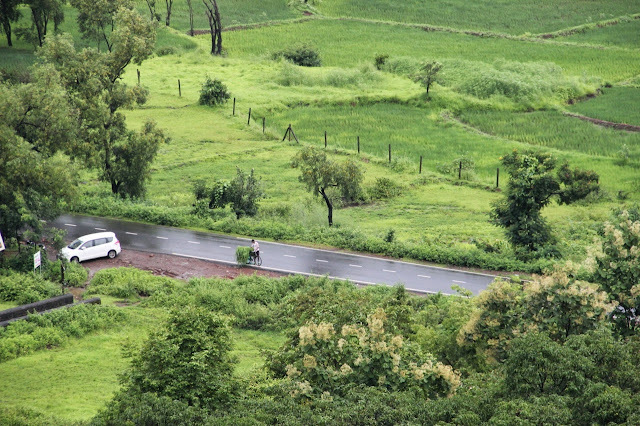 During my previous visits, I had always enjoyed the drive from airport to New Mumbai but this time it looked very unclean. Even though it isn’t as clean as Bangalore, I had never felt this way before. I thought it was because of the Monsoon. The new bypass road does not take you inside the city anymore, so perhaps thus, i got to see more of suburbs that are not very clean. The sides of the roads were filled with old buildings, houses and lots of garbage mainly consisting of plastic. I think it is hard to maintain such a population in a city and expect 100% cleanliness when people from across the country of different class, creed and culture are all staying in the same place. Recently my notice towards our civic sense has increased. May it be in some streets of Bangalore or in the villages of North Karnataka or now in Mumbai, the case was more or less similar. More the population more the issue. Anyways, thanks to the google maps, this time I did not have to call my sister to ask for directions. 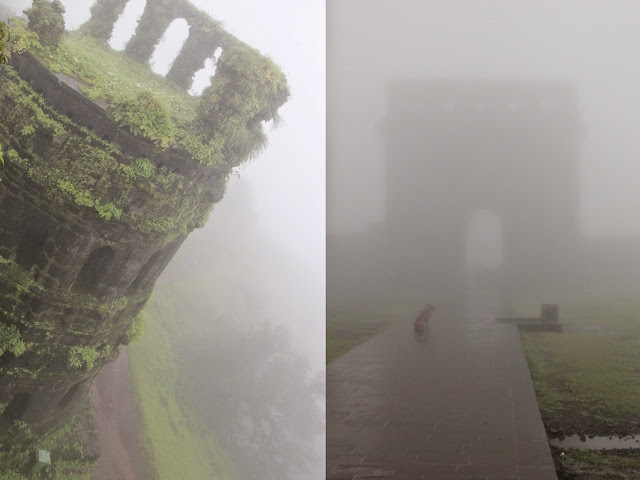 I always get lost when I enter new panvel. I reached the apartment in an hour thanks to a holiday no traffic expressway. At home Akki, Bawa and Deeku were busy preparing for the Pooja. Akki cooked the Mangalore Ganesha Favourites - Mudey (A type of Idly but batter poured in cups made of Jackfruit leaves), Sweet Appam, Sweet Modaka and Spicy Modaka, Chakuli, Laddu and many more. After the pooja at home, we were invited by her neighbours for Aarathi at their place where they keep Ganesha idol. I met Ganesh Bhai and Shivam there. Everyone close to this family had gathered and it was a collaborative effort from all to celebrate this festival. Ganesh Bhai had last night spent considerable amount of time to come up with this magnificent decoration for the pendal. Every year he finds a new design as back ground. They shared with me the pictures of previous years. Aarathi here is much different from what we see in Mangalore. 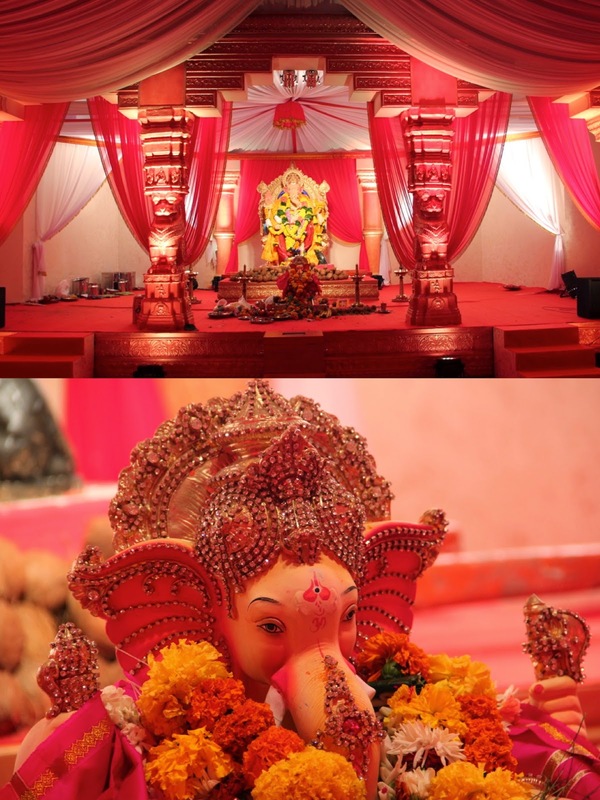 Songs are sung and everyone gets to perform aarathi to lord Ganesha. I got my chance too. My bad headache from waking up at 3:00 AM made me a little dull this day. I enjoyed capturing the Mumabikar spirit of celebrating the festival. We also went downstairs where another Ganesha idol was placed as a common one for the entire apartment. 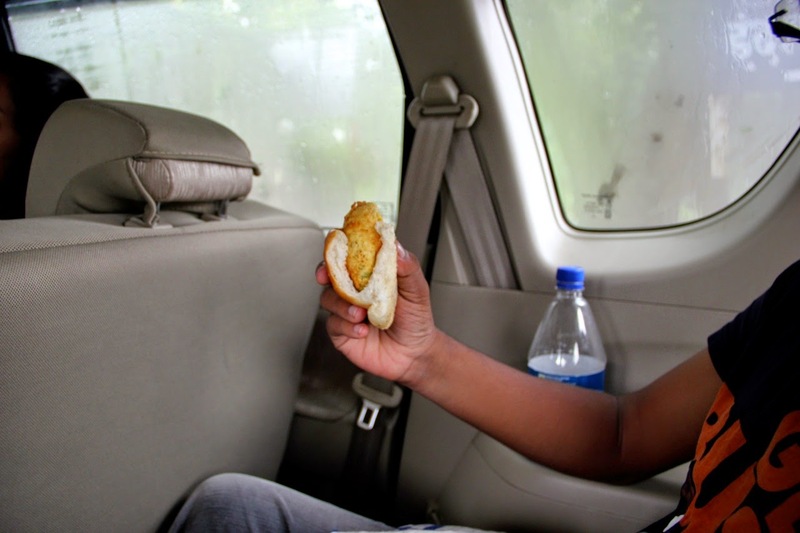 We headed back home where Ganesh Bhai and his son Shivam joined us for brunch. After which we made plans for our late night visit to all the important pendals of Mumbai. One of my friend Anupam and I had initially planned to photograph visarjan. Coincidently, he messaged me asking when was I coming to Mumbai and as he learnt that i was visiting the pendals that night he wished to join us as well. I thought of catching some sleep that afternoon but I was unable to do that as I had to finish the novel "Avarana." What an incredible book. I shall save details on this book for a separate post on a later date. For dinner Akki’s friend had packed some Rajasthani Daal-Bhaati. I went for aarathi and then headed back home for a quick nap. I had much needed two hours of sleep before I could take off on a all night Mumbai excursion. We left home at around 10:30 PM. Picked Anupam on the way at Vashi. Reached the main city by midnight. 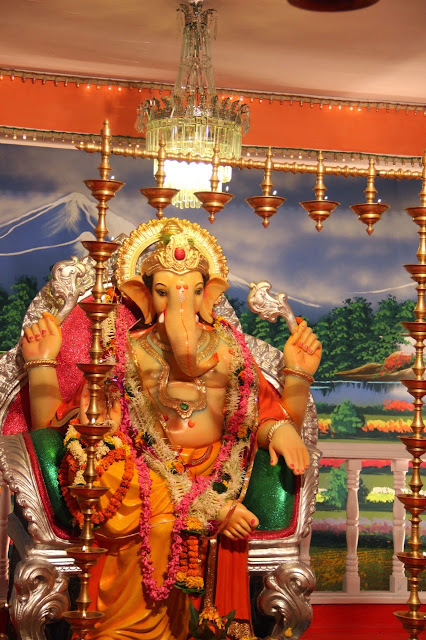 Directly went to Lalbagh cha Raja, the most popular Ganesha idol in Mumbai. Even past midnight there was maddening crowd here to view their beloved Ganesha. We walked several distance to find this contact that Ganesh Bhai had. He would lead us directly to Darshan by skipping the long queue. After a lot of searching we finally met him. He took us through narrow back streets that looked like the ones in gangster movies where the goon is chased by the hero as he escapes through narrow streets full of old houses on one side that has extended their livelihood on to the street. Thats when it began getting exciting for me. I was loving this experience. Soon we got close to the idol. But we still had a huge hurdle to cross. A set of volunteers were struggling to push away others like us from entering. After a struggle of about 30 minutes we finally got in. The crowd was crazy. 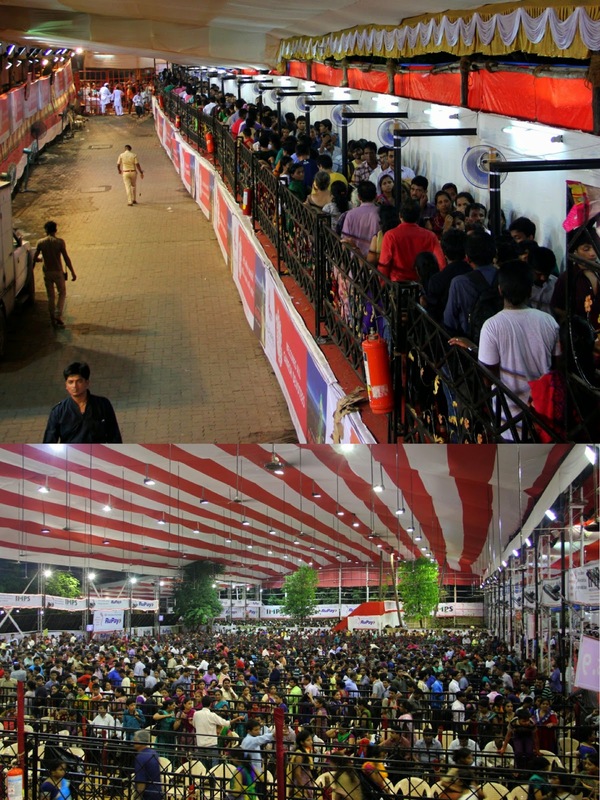 Hats off to the volunteers for handling such a crowd. We got into the queue very close to the idol. While waiting for our turn to reach lord Ganesha, Anupam and I got to click few moments. 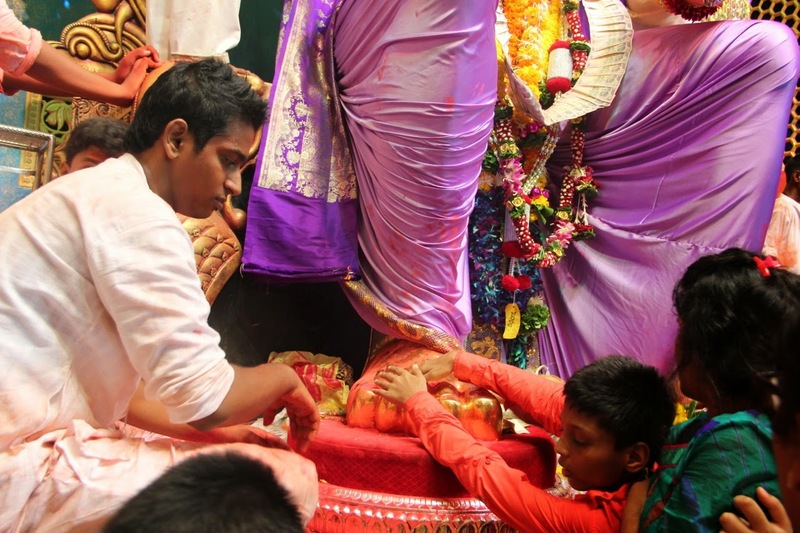 After a few minutes of wait, we got to reach the idol and sought blessings from Lord Ganesha by touching the feet. While returning, we saw the tired faces of those who where waiting for Manat (That is to reach the feet of Lord Ganesha and sought blessings). They had been waiting since morning. I felt extremely guilty for having gate crashed. For someone without contacts at the place it would take 24 hours for what took an hour for us. But what was good is that free food and water is offered by the volunteers to the devotees. We took the alley again to reach the main road. 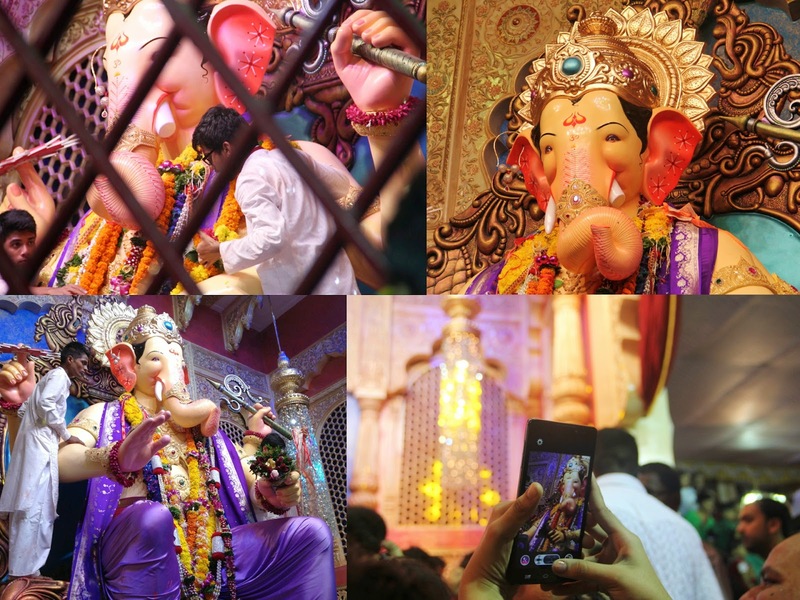 Our next stop was « Mumbai cha Raja ». Here instead of taking a Rs10 ticket we made a mistake of going for free darshan thinking it would not be as crowded as the previous one. As this place is very close to Lalbagh cha Raja people visiting there would also come here. The free Darshan line did not move at all and it took us almost more than an hour to reach the idol. I felt happy about this wait because in someway it made up for my guilt of gate crashing at the previous place. 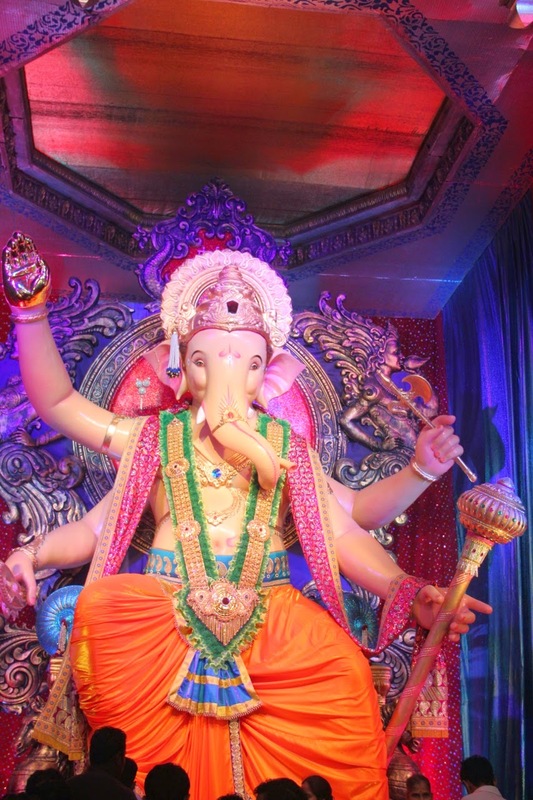 During our wait, Ganesh Bhai told me that earlier Mumbai cha Raja was the most famous Ganesha Pendal in Mumbai. 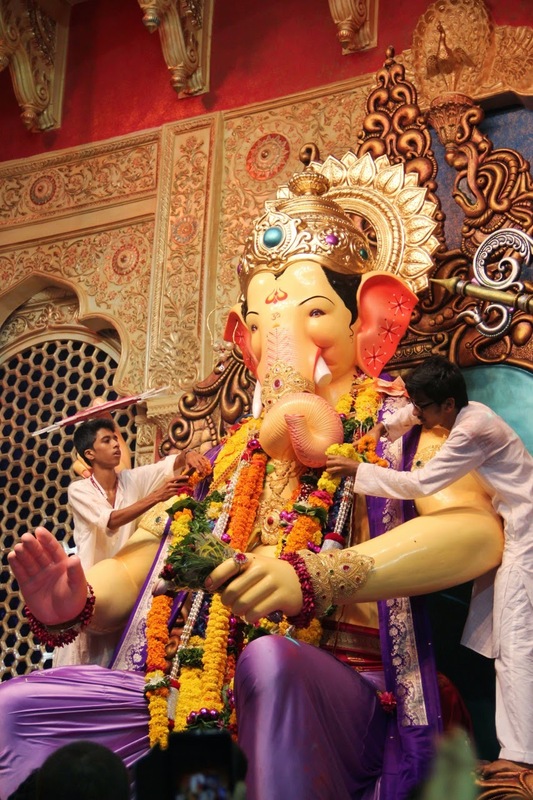 But over time due to media publicity Lalbagh cha Raja has gained prominence. There is also some kind of rivalry between the two groups who do not encourage people to wear topi’s (Caps) that board the names of other. This pendal had a speciality. 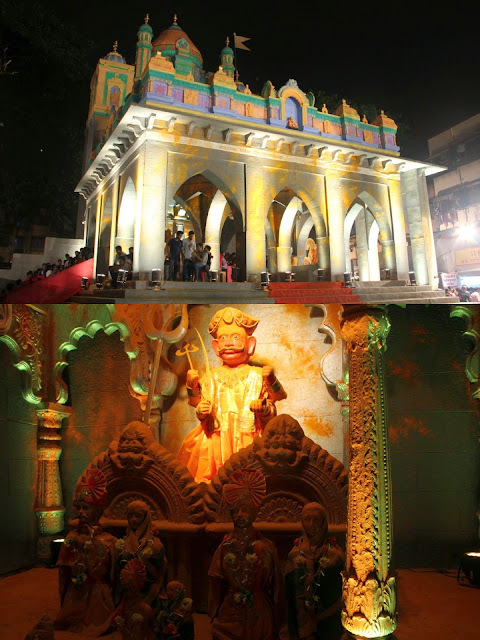 They had recreated a temple called Jejuri with its main diety Malari Marthand. The volunteers at this place were college kids who did not even bother to get the free darshan line moving. Ganesh Bhai had to scold them in Marathi to wake them up from their relaxed position and have the line moving. At the end of the queue another beautiful Ganesh idol was awaiting us. Next stop - GSB ganesha pendal. This is considered the most expensive one because of the amount of jewellery on it. The idol itself is insured for a huge amount. This group is led by the Mangalore Konkani community. 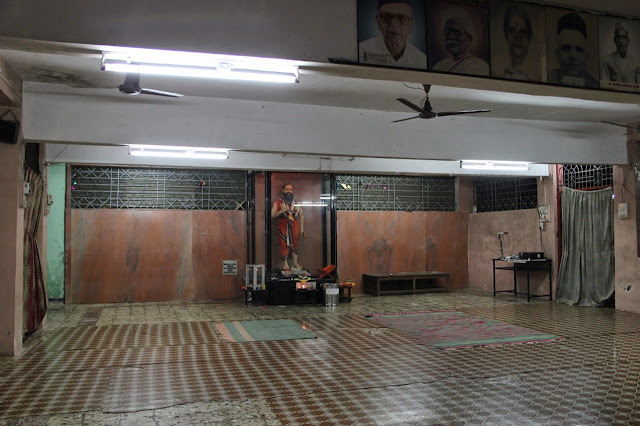 At 2:45 AM the pendal was deserted hence the darshan was quick. However, only in this pendal, photography is prohibited. After this, we drove to Chembur and visited the one that is said to be maintained by underworld Don Chota Rajan. This was set in the theme of Sayadris. Interiors though had the feel of ghats at Banaras. The Ganesha idol in a sitting position was lavishly decorated and looked stunning. We then drove to Subashnagar where Ganesh Bhai had grown up. Here it was only us. The back stage and interiors of this was done by Ganesh Bhai’s friend Prashanth whom we had met last time at the film studio where he is an art director. Everyone was hungry so we went stopped at this street food place at around 5:00 AM. Poha, idly and vada with some tea made some good early breakfast. It was interesting to see that this place was very crowded. Our last stop for the day was at RK studios. And also another one just next to it maintained by some Bank. It was an exhilarating experience. It never felt like night actually. We returned home by 6:00 AM. Next day, I slept till 10:30 AM. Had some bread toast for a late breakfast and freshened up. Early lunch was ready by 12:30 AM. Baingan ki sabji and Rice Bhakri. Some rice and sambhar as well. After lunch I caught some more sleep until my cousin Anupama and her family came home. It was great talking to her after a long time. 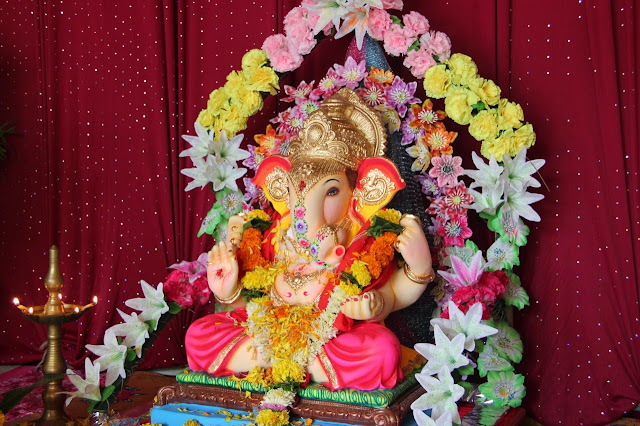 Normally Ganesha idols are immersed on the second, fifth and eleventh day. At Akki’s neighbours house it is done on the second day. So we got ready for the procession. 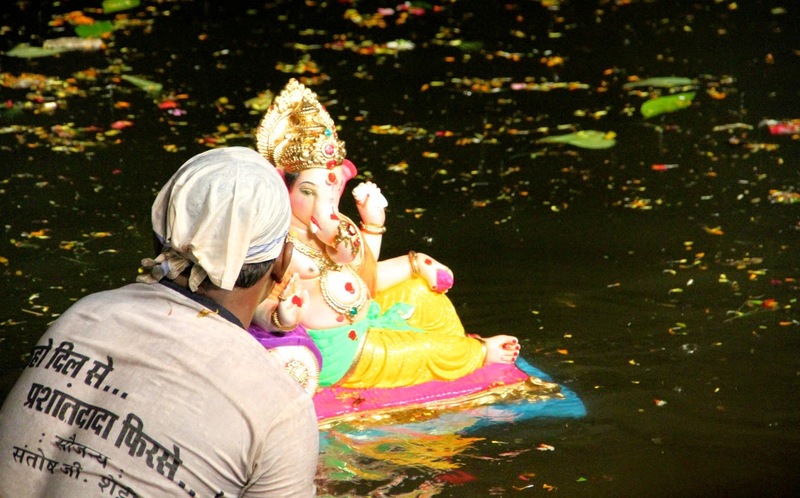 It was interesting to see several Ganesha idols being taken for immersion. It was raining continuously and that did not seem to bother the devotees from dancing and enjoying their festive mood. Well there are all kinds of people in India. 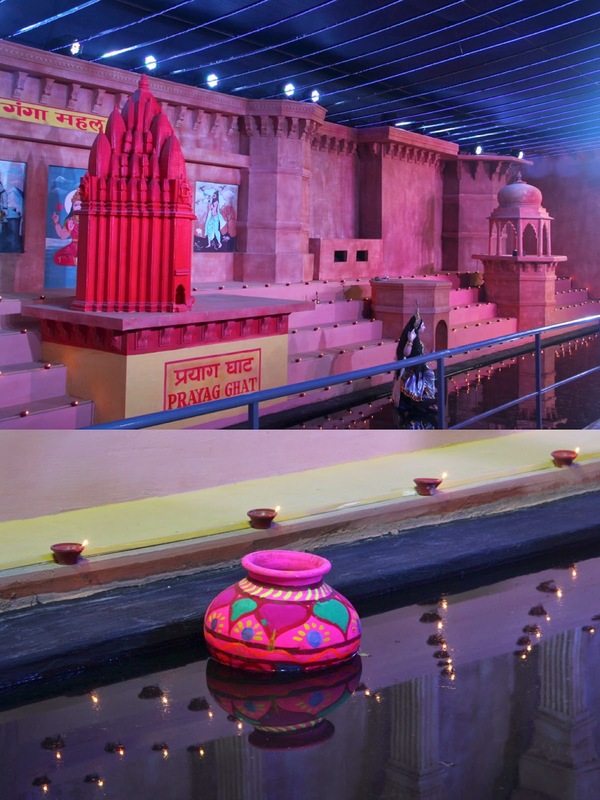 If on one side there were all these families religiously following the ritual on the other side there were bunch of men who took this opportunity to drink alcohol as they danced. This seemed a little out of place from the tradition that most of the other families where practising. The lake was all fenced and volunteers arranged by the local MLA were immersing the idol for the devotees. 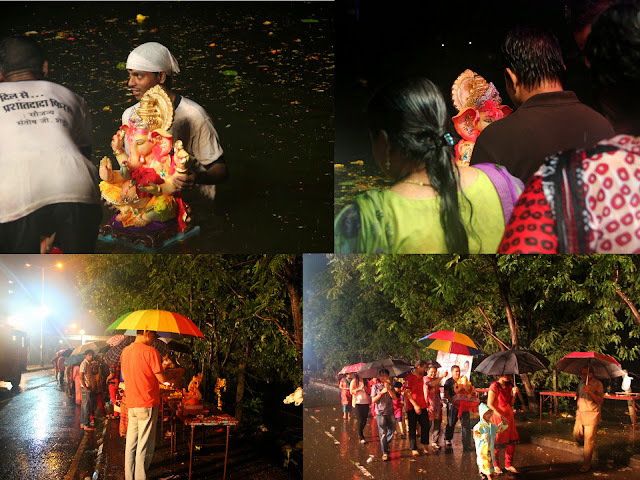 I watched all the devotees carefully carrying their Ganesha to the benches placed and doing one last arathi before handing him over to the volunteers. With emotion and devotion they watched their beloved lord slowly immerse in water taking away all the evil and bad omens. I have always been attracted to lord Ganesha. I am not sure what is it about this lord that makes me love him more than any other God. Perhaps its the proper blend of man and animal. Not just any animal. For instance, I am not similarly driven towards Narasimha, who again is a blend of man and animal. 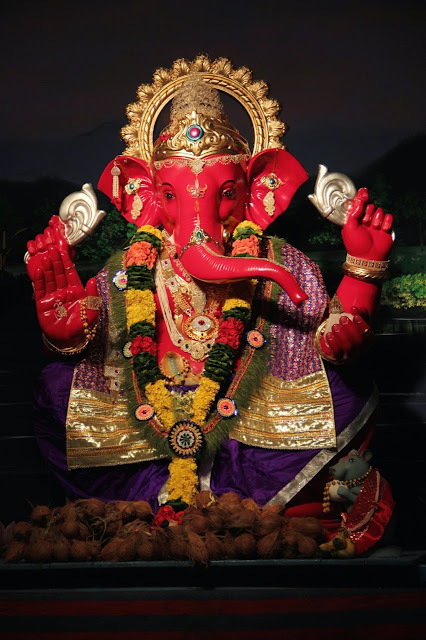 You feel a personal bonding with Ganesha for some reason that does not come with any other God. With others its mostly devotion but with Ganesha its more of friendship or a kind of feeling when you see a cute baby. You want to cuddle the baby and hold it close to you. And what other place than Mumbai could I have been in to watch this devotion, this love and this friendship between God and man. 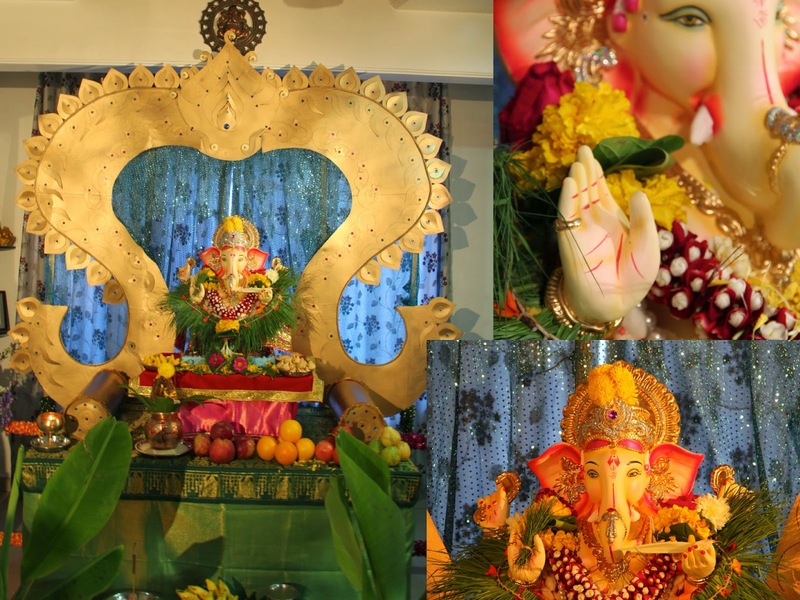 This would remain as one of my best Ganesh Chaturthis ever. I was a lot fresh this day. My fever and cold were slowly retracing. I was up and ready very early as usual. We had a quick breakfast at the hotel where the lodge care taker informed me that the owner was from Mangalore. But the owner for some reason was not happy about this revelation. He scolded the boy. I decided to ignore him and not talk to him about his origins if he was so reluctant, which seemed so not Manglorean though. Previous day, we had also met a Nandini store owner who was from Kundapura. For the past two days, I had been observing a fortune teller just outside our Lodge. He would be there every morning and by noon would disappear. I joked that he had a good work life balance. I wanted to experience this once. So this being my last day I decided to do that. My intentions were not really to mock him but to see how this was done. He asked me the first letter of my name and I answered « Aa » and he told me that I was of Mesha rashi (A particular star sign) which I was not so I told him that I was Meena rashi. But he did not get it and insisted to stick with Mesha Rashi. I decided to keep quite. 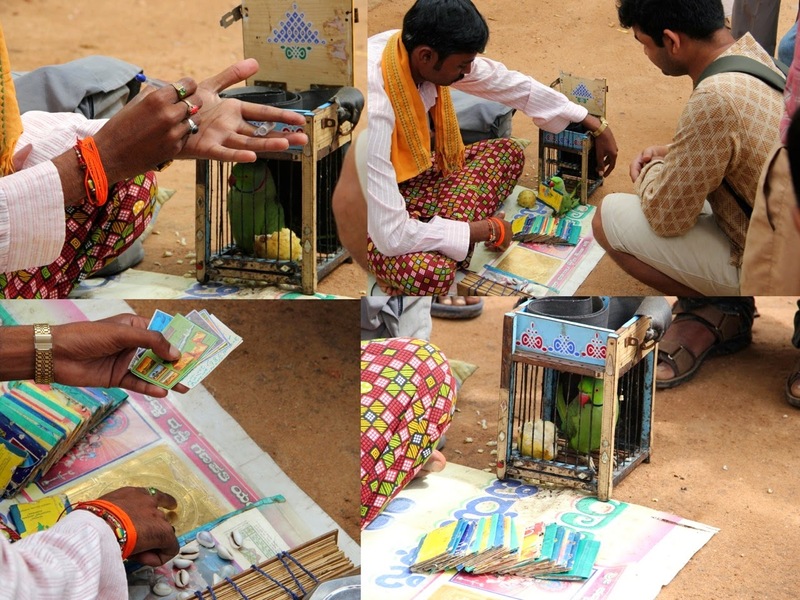 He opened the doors of a cage within which was a parrot happily feasting on a big guava fruit. It put tiny steps forward and picked one of the booklets from the collection he had. He almost immediately prompted it to drop that and pick the next one. I found that really funny. But the parrot did not do as instructed and held on to the one it had picked. I asked him to read that anyways. The booklet had several small images. Some of Hindhu gods some of muslim mosques. He told me that I would travel a lot and achieve fame in everything I do. He shook my hand and told me that I shall succeed in every initiative that I take. That was it. By now a crowd had gathered to know my future. I asked what could I pay him and he asked me to pay as much as I wished. I decided on Rs50 for not so informative session but then added another 20 to be nice. He immediately pulled out a photo from his bag. It was of him with a MLA and told that he was a regular customer. Perhaps by showing me a wealthy customer of his he was hinting on increasing my offerings. But I did nothing like that. I had already lost respect for him the moment he had instructed the parrot to drop the booklet it had picked and select another. He had not even told me the meaning of every photo even though I had requested. This could have been easily anybody's future.To impress a customer he was not truthful to his profession. That was the only reason for my disrespect for him. We rode to the village. All moans of agony in the house that was mourning had now confided itself into deep corners of the minds and a haunting silence seemed to emerge from the house. At School, all the kids were well behaved today due to the presence of teachers who scare them with sticks and screams. Few kids were cleaning benches and their class room. The room had been painted fresh and the labourers had left without cleaning. I would have been perfectly okay with the kids cleaning the room and the benches if it was done for them. 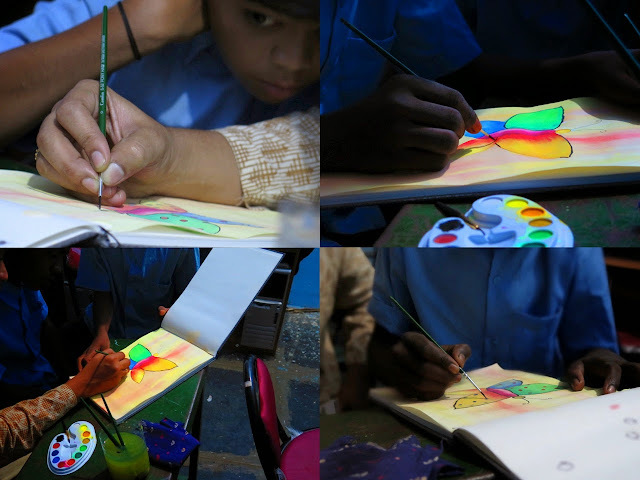 But, the class was painted only to keep a Ganesh idol during the village festival. That seemed a little inappropriate. All morning, Yulia, Gautam and I stuck the paintings on thick handmade colour papers and hung them on the wall. Stefan had food poisoning and so he left early. To help us with sticking the art work, we invited four girls inside the computer lab. While speaking with them they informed that they love to attend school but where unsure what would happen after 10th. Many farmers do not have money to spend over their kids education beyond the free education provided by Government. But they informed me that there were few girls from the same village who had managed to become engineers. We took a short walk around the village. Stopped at a small store for some cold drinks. 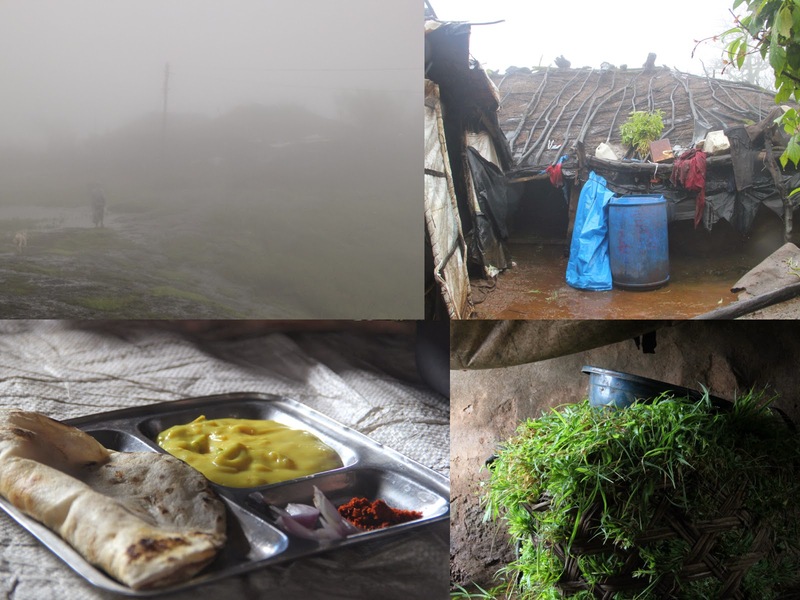 Gautam regularly visits this place and the lady who owned the shop invited us over for lunch the next day. We returned back to school and had some buns and apple for lunch. 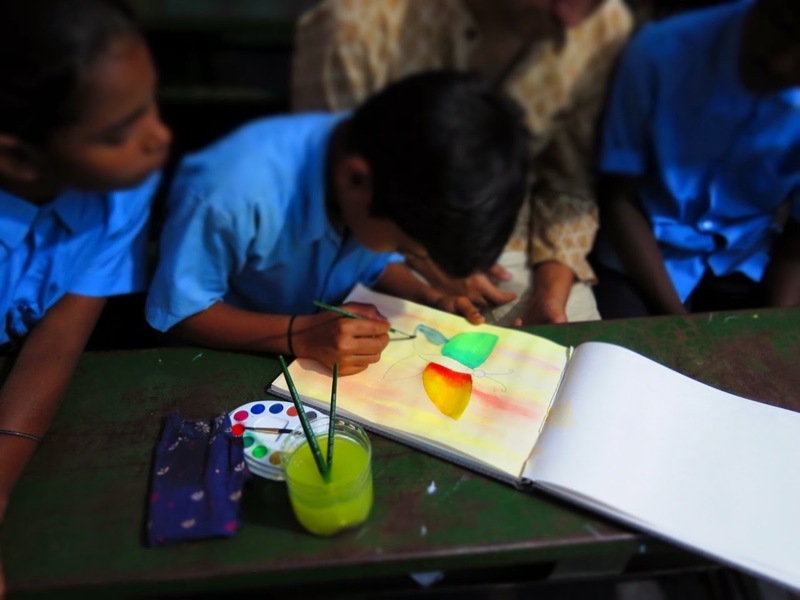 I had requested four kids to join me in a special art session. Manjunath, Keshav, Santhosh and Sakkubhai were very talented and got easily noticed during the workshop. I might have missed many others. Together we started a painting. I taught them how to mix colours, how to shade and sharpen the brush for thin lines. They had questions and they had interest. They were extremely attentive in every word that came out of my mouth and towards every movement of the brush. One by one I asked them to do portions of the same painting and the result was a beautiful collaborative work of art. 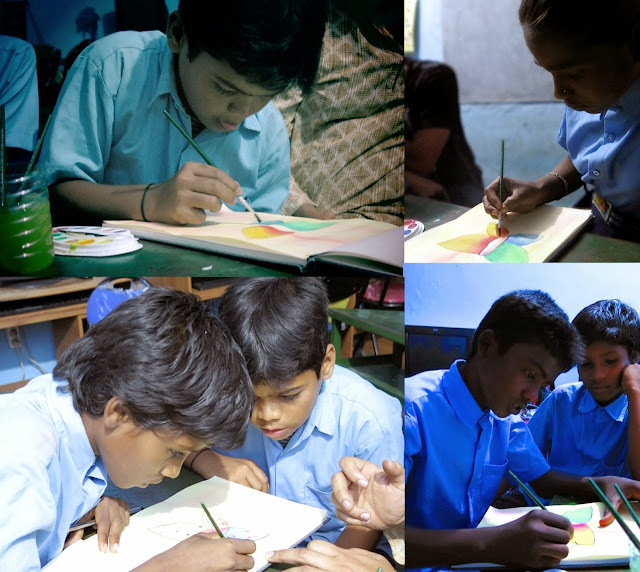 I had experienced the most satisfying painting experience of my life with these bright and creative kids. 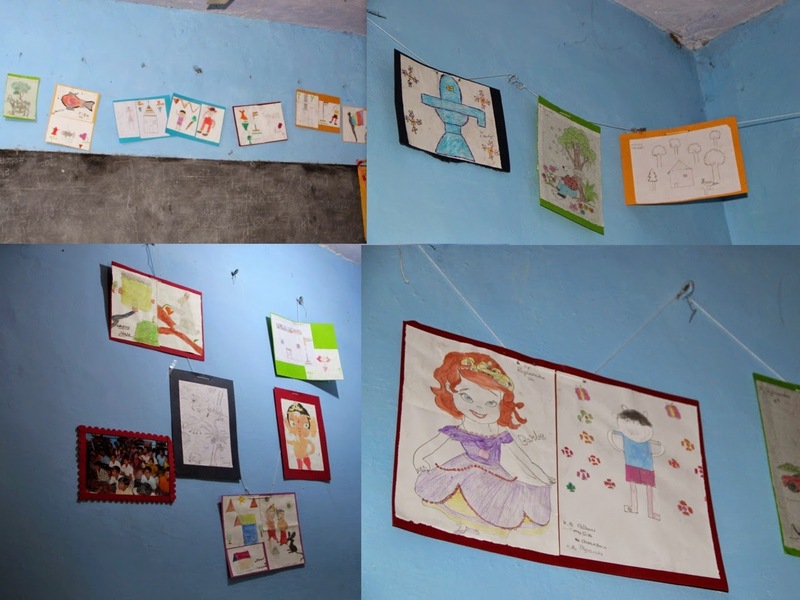 I handed them the paint boxes, papers and pencils and requested them to continue their good work. Before leaving, I took a tour of the school. The kids seemed engrossed in study. One primary school teacher asked me - "The kids in the city are well behaved than these, aren't they?" I answered to her - "Kids are kids, where ever they are" and moved on. Another teacher took special interest in showing me around the school. The staff room was filled with headmaster and teachers who gave me a weird look as I was introduced to them. All together it appeared to me that only the kids cared for what was being done. The kids even requested us to give away the pencils and pens to them individually rather than handing it over to their teachers as that they thought would not be distributed. A mistrust in their own teachers would be the last thing I would have expected. Growing up in a city, I had only learnt to respect my teachers and regard them to be just. What was wrong here? The government school teachers are well paid. Moreover, they have far more benefits than the private school teachers. Free lunch and tea is served to motivate the children to attend classes. Yet the standard of education in these schools as compared to that in the cities are no where close for a comparison. So is it passion that is missing here? Are these teachers in this profession because they find this an easy thing to do? Is it because they could not become anything else that they are teachers? This might need further investigation from my side before coming to a conclusion. Even in the cities these days the quality of teachers have gone down. I tried to think of a root cause and saw that the present teachers would have come from my generation. Mine was a generation of engineers. Every house had to have an engineer. So the bright ones who could have become good teachers are perhaps now software engineers. Very few follow their passion and rest succumb to family demands. Things are changing now with the present generation thinking beyond Engineering and Medicine. Well reasons are many and requires scrutiny. 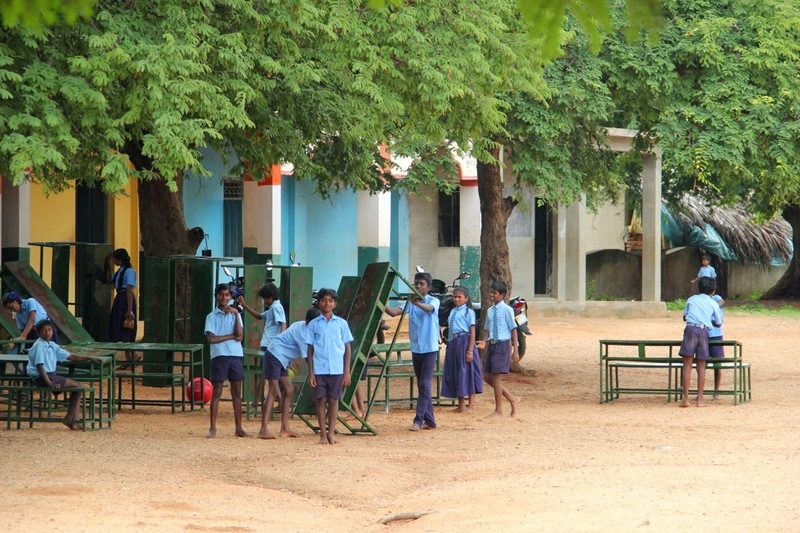 What is also shocking to view is that the kids were pooping in the school ground. Most of the village houses do not have toilets and they have to go to the fields. This was the case in my hometown Surathkal perhaps 20 years ago; that too in a few houses. But in the villages in North Karnataka this is a reality even today. Yet some of our own people criticise our Prime minster for funding the construction of public toilets. I was both happy and sad as I left the village. I was very satisfied with this experience that had brought in me a positive change that would be impossible to be expressed in words. At the lodge, I thanked Stefan and Yulia and expressed how glad I was to have met them. I did not help the kids with anything, they helped me in finding a purpose to live. Yulia and I walked to the medical store and grabbed some medicines for Stefan. I left at around 5:30 PM to Hospet. Gautam accompanied me as he had some work in Hospet. Per initial plan Both Stefan and Yulia were supposed to see me off at the railway station but Stefan was really sick by the time we returned and he had to take rest. 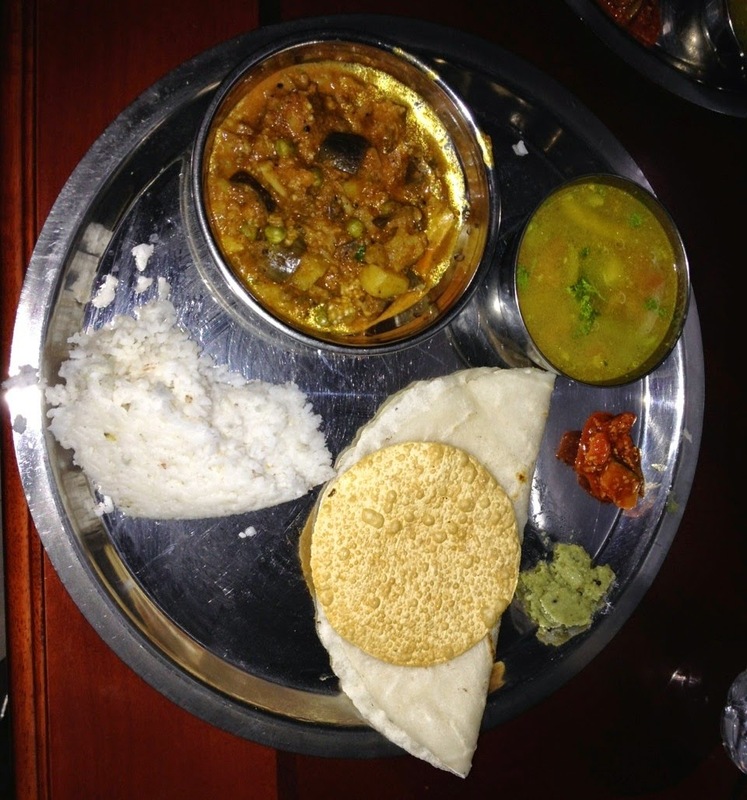 Gautam and I traveled to Hospet and had some food at a Udupi restaurant where he had made friends with a supervisor. During his previous visits the supervisor had been of great help with some work they needed to do. He was expecting a baby soon so Gautam wanted to buy some clothes for his kid. We shopped for that and walked to another store near Gandhi square to buy a vehicle fan for an auto driver who used to drop them off at the village for free. We then came back to the restaurant and finished our dinner. Took an auto to the railway station. I thanked Gautam for his company before he left back to Kudligi. I had truly enjoyed our conversations and debates over several topics. He is young and is filled with several good ideas and seems to be heading in the right direction. I had an uneventful return journey. I slept well in the train. In the morning as I headed back to my house I was a different person all together. I was filled with immense joy and my mind was at peace. No thoughts filled my mind, it was empty and perhaps that is what we call as happiness; a voidness in the mind with absolutely no thoughts but just happiness.